I love my Cricut Create a Critter cartridges but they can look a little plain for all the work that goes into them so I was searching the internet for an idea to jazz up the horse from the original Create a Critter cartridge and I came across Candace at Scrappin 3 Little Princesses. 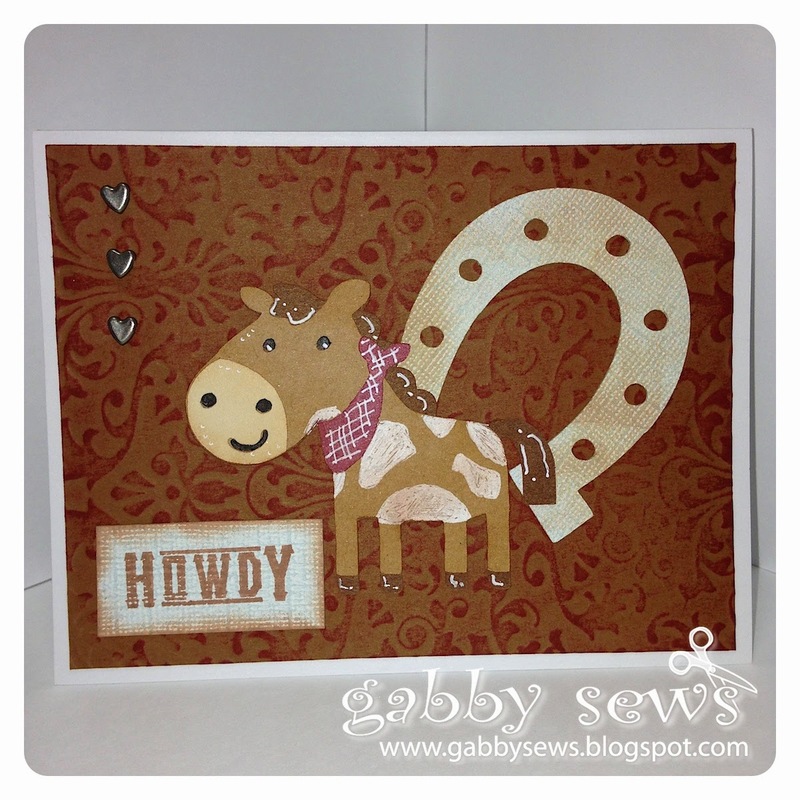 She did the coolest thing with the horse and what's really funny and quite coinkydinky is that when I cut out the horses I also cut out some horseshoes to use on other cards but she used one of them on her horse card and I think it's so cute so I scrap lifted the idea. I hope she doesn't mind! These cards are my standard A2 and are going to OWH for the call they put out for Western related cards. I used Core'dinations solid card stock for the horse and a piece of patterned paper from DCWV Boyhood Stack for the bandana with some embellishing done with a Gelly Roll pen. That coinkydinky horseshoe is cut out from some random paper I got in a grab bag of paper from my LSS years ago. It has a linen type of texture to it and it's this strange light blue tinted color. I rubbed some Tim Holtz Vintage Photo Distress Ink on it and a little bit on the horse as well to give them both a little dimension. I also took a cue from Candace and added some highlights to the horse with my Gelly Roll pen. I really like the way the extra little time it takes to do that makes the Cricut cut so much better! My husband even got in on the act and created the paint horse on the picture. I think it's my favorite one and will be the one I keep for my collection. I didn't have any paper in my stock that really worked for me so I tried to create a tooled leather look with some Core'dinations brown card stock that I embossed using a Darice Damaske Background embossing folder. Then I worked on adding some Tim Holtz Distress Ink in Barn Door rubbed over the image. I first tried using a make-up sponge to put it on the paper but it wasn't working so I just started rubbing the actual ink pad on the paper lightly and it worked great! I really like the look it gives. Unfortunately I couldn't get a picture that really showed how nice it turned out. It felt like it was missing something so I added three small square brads that I had in my stash (the special one my husband helped with got hearts) - not sure where they came from but they are really flat so they should pass the dimension rules for OWH. The sentiment is stamped with the same Vintage Photo ink using my new My Favorite Things Howdy stamp set that I got from OWH's recent fundraising effort. I was thrilled that I got it in time to make these cards for the Western card drive. These cards are due by March 20th so my box will be going out this weekend. Sentiment paper size - 1 3/4" X 7/8"
Background paper - 4" X 5 1/4"
Here's a link to Candace's card: http://scrappin2littleprincesses.blogspot.com/2011/08/horsie-hello.html - you should really check out all her creations. She is very talented!! Love It! I have Create A Critter, and I love it too, nade a lot of cards with it! Thanks Eileen! I think I've used my CAC cartridges more than all my other cartridges combined.